MELBOURNE — A cartoon of Serena Williams that has been widely condemned as a racist depiction of the tennis great has been partially reprinted on the front page of the Melbourne-based newspaper that initially published it. The newspaper, which has Australia’s largest circulation, has defended its cartoonist Mark Knight’s depiction of Williams and is asserting that the condemnation, which has come from all parts of the world, is driven by political correctness. “If the self-appointed censors of Mark Knight get their way on his Serena Williams cartoon, our new politically correct life will be very dull indeed,” the paper said on its front page. Williams has won the Australian Open singles title seven times at Melbourne Park, including in 2017 when she was pregnant. She is a crowd favorite at the first tennis major of the year, which is held each January at a venue that is within sight of the Herald Sun’s headquarters. Knight reportedly has disabled his Twitter account after his post of the cartoon attracted tens of thousands of comments, mostly critical. During the final against Osaka, Williams got a warning from the chair umpire for violating a rarely enforced rule against receiving coaching from the sidelines. An indignant Williams emphatically defended herself, denying she had cheated. A short time later, she smashed her racket in frustration and was docked a point. She protested and demanded an apology from the umpire, who penalized her a game. “I was deeply offended. This is not a joke,” said Vanessa K. De Luca, former editor-in-chief of Essence magazine, who wrote a column about the U.S. Open furor. 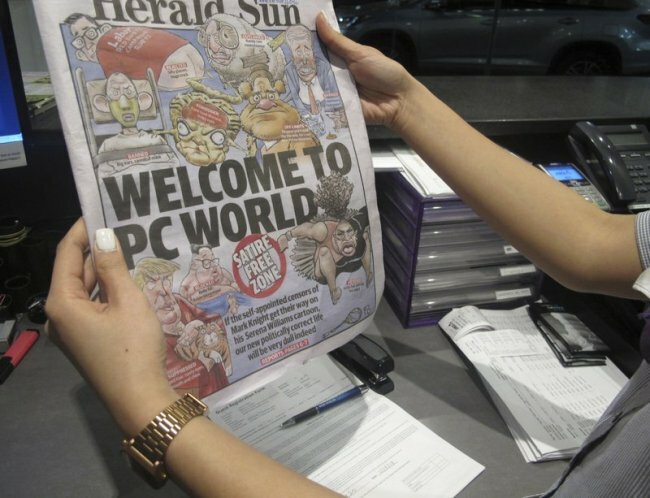 This isn’t the first time a cartoon in a News Corp. newspaper has drawn allegations of racism. In 2009, civil rights leaders and others criticized a New York Post cartoon that some interpreted as comparing President Barack Obama to a violent chimpanzee. In Britain, where fiercely competitive tabloids often trade in sensationalism, Rupert Murdoch-owned newspapers have been accused of sexism, racism and xenophobia over the years. Last year a former editor of the Murdoch-owned Sun, Kelvin MacKenzie, quit as a contributor to the tabloid after writing a column comparing a soccer player with part-Nigerian heritage to a gorilla. Many years of outrage over articles and cartoons did little to hurt Murdoch’s power over British politics and media, though his papers’ underhanded practices did. Murdoch was forced to shut down the 168-year-old tabloid News of the World in 2011 after the revelation that its employees had eavesdropped on the phone voice mails of celebrities, politicians and crime victims. “Freedom of speech doesn’t mean freedom above criticism,” she said. “I was deeply offended. This is not a joke,” said Vanessa K. De Luca, former editor-in-chief of Essence magazine, who wrote a column about the USOpen furor. “What we have is a bunch of people who get paid to publicly exercise their implied freedom to speech then whining when people disagree with what they have had the privilege of being paid to say,” she added. Australian writer Maxine Beneba Clarke said she believed the front page demonstrated a “misunderstanding” of the criticism leveled at the cartoon. “I think it’s really interesting that the Herald Sun has not included really any other caricatures or cartoons of black people — either Aboriginal people or African-American people, black people of any descent,” Clarke, who is of Afro-Caribbean descent, told Australian Broadcasting Corp.